What are those sticky labels with four-digit numbers called price look-up codes? Some organic produce gurus try to tell us that the numerical codes attached to pieces of produce can tell a lot about their origins - we investigated if this is true. One of the annoying realities of buying veggies and fruit in large commercial markets is that many items are identified with sticky labels with four-digit numbers called price look-up codes. Labels may save the checkout clerk from having to learn the difference between rutabagas and radicchio, and they can give you a way to tell the price of your produce by weighing it before you put it in your cart. Some organic produce gurus try to tell us that the numerical codes attached to pieces of produce can tell a lot about their origins. 4 digits only supposedly means that the produce was conventionally raised, with possible exposure to fertilizers, herbicides, and pesticides. For instance, 4129 identifies a Fuji apple. 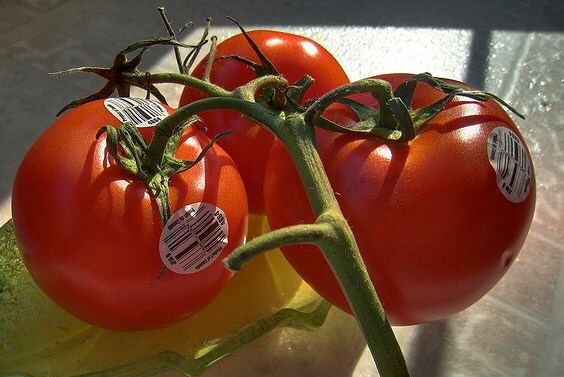 An "8" plus 4 digits (the same 4 digits used to identify the same kind of conventionally raised produce) supposedly means that the produce was genetically modified. It may also have been exposed to fertilizers, herbicides, and pesticides. In this scheme, 84129 would identify a genetically modified Fuji apple. A "9" plus 4 digits (again, the 4 digit code identifies the species of plant) supposedly means the produce was raised organically, never exposed to fertilizers, herbicides, and pesticides. In this scheme, 94129 would identify an organically raised Fuji apple. But the reports that produce codes really identify which products are organic, conventionally raised, or GMO is just an urban myth. The Produce Marketing Association in fact created a five-digit numbering system for price look-up numbers for genetically modified produce beginning with the digit "8," just in case some company should want to keep track of genetically modified produce in their inventories. Almost all yellow squash and zucchini, which were genetically modified in the early 1990's to give them resistance to a mosaic virus that causes green mottling on their skin. Produce that is labeled as organic cannot include any intentionally added genetically modified ingredients. An organic farmer is not prevented from calling sweet corn organic even if pollen from genetically modified corn plants blew in from other fields. There are no genetically modified animals approved for human consumption in the USA. However, the 365, Field Day, Keller Crafted Meats, Natural Sea, Pure Country Pork, and Tonnino brands certify that the animals used in their products were not fed genetically modified grains. And what about checking the produce code for the "9" to indicate it was organically grown? American companies are not using this convention, either. The code 4129, for instance, is used both for conventionally raised Fuji apples and for organic Fuji apples. Certified organic produce is labeled in words reading "certified organic," and you can also tell by the price. Julia Moskin, "Tired of Peeling Off Produce Stickers? Tattooed Fruit Is On Its Way," New York Times, 19 July 2005.